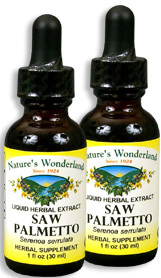 Saw Palmetto Extract, 1 fl oz / 30 ml each (Nature's Wonderland) - Penn Herb Co. Ltd. Saw Palmetto is the leading herb of choice for promoting prostate comfort, healthy urinary function - especially for men over 50. Simply add our fast-absorbing extract to juice or water. Saw Palmetto has been linked with urinary and reproductive health ever since early Native American tribes used the berries as a diuretic and sexual tonic. It was even included in the United States Pharmacopoeia in the early 1900s. Today, Saw Palmetto's natural fatty acids are recognized for providing nutritional support for prostate and male libido function. COMMON NAMES: Sabal, Sawtooth Palm, Serenoa repens. AMOUNT PER SERVING (333mg/ml or 30 drops): Certified Organic Saw Palmetto Berries (Serenoa serrulata). OTHER INGREDIENTS: Grain Alcohol (70-80% by volume), Deionized Water. Free of: milk, dairy, egg, fish, shellfish, tree nuts, peanuts, wheat, gluten or soy. Promotes prostate health; supports healthy urinary function; promotes bladder comfort; supports reproductive health; mild herbal diuretic.